Skechers has catered to the active individual for years. Their product combinations heighten the focus on a certain space, exploring this area and implementing features that suit the task. Their creation of footwear series has covered the walking, casual, comfort, and running spaces. The Go Run Ride 4 running shoe includes features that are optimal for the running space. Below we'll take a deeper look at this model, detailing the features and benefits one stands to gain from this footwear option. Skechers continues to scale their reach over the marketplace with the Go Run Ride 4 model. Their unique credit to the specific space marks for a positive relation to attention to detail. They apply focused means to this space, running multiple tests and exams to ensure this shoe can stand up to the intended task. The roomy toe box, heel cup, and other such spacings make for the proper usage means for any sized foot. The designs also help to benefit the runner at all times of the day, with reflectivity and glow assisting the night owl runners. Check Price on Amazon! Skechers, as a brand, has worked to adapt to the different streams of physical activities one would perform on a daily basis. Whether it be yoga or long distance running, the footwear space has adapted to the niche market. The prescribed task is met with intense focus and a true attention to design. The Go Run Ride 4 model implements the proper tendencies and materials to ensure you can take on your running course. The shoe is built from synthetic and textile materials, making it a lightweight running option. The shoe also introduces reinforcements all across the design, allowing the user protection and increased support. With every shoe model, there are things we love and things we could do without. Most shoes run true to size, allowing you to apply your average athletic footwear size to host the correct fit. Some have found benefit from going up or down a size. The Skechers fit may differ from brands like Nike, Adidas, and so forth, leaving the sizing component at the user's digression. The fit is rather snug, allowing you to reap the benefits from the prescribed features. The toe box is spacious, the back-hell area offers some give and flexibility, and the midfoot area is not too tight. The elements are there for prescribing excellent fitting means. The outsole is made from rubber materials. It is built-up to about an inch of thickness, keeping the user lifted off the surface. The undercarriage is treated with spaced dots. These dots extend slightly from the undercarriage, helping them to double as grippers and pressure reducers. Their placement caters to the main tendons and bones of the foot. They are also spaced to apply an even amount of pressure to the bottom of the foot. They are coarse in design, which helps you gain traction over a multitude of surfaces. The midsole is designed with proprietary Resalyte technology. This is a lightweight EVA option that is injected with memory foam materials. This helps to retain arch shape and work to mold to the midfoot area. There is also the introduction of M-Strike technology at this region. This allows the user to gain the proper foot striking, reducing the need to apply additional pressure or to change up your routine. Both of these elements are housed near the outsole, leaving a dual benefit from these two regions. 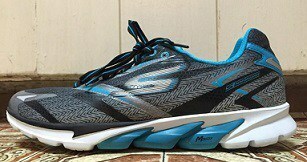 The Go Run Ride 4 model holds one of the strongest uppers that Skechers has ever engineered. The textile and synthetic build is overlapped to produce long-term protection. This extends slightly from the upper space, allowing for the extra weight to place little affect on your running style. The upper is also the location where the padded collar overlay is featured. This makes access to the insertion point simple for the user. This design also plays a key factor to breathability concerns, which we will detail later. The total weight of this model comes in just below 9 ounces, making it a strong proponent for lightweight success. The materials used host little weight and their distribution occurs at an even-keel throughout the model. This helps spread the heavier elements, reducing the affect on any one area of the foot. This is a model that promotes fluid movement and it won't weigh you down. The Go-Dri technology helps to wick away moisture, keeping the weight even and distributed correctly. Breathability is accessed through the small holes in the outer shell and the insertion point design. These little holes allow air to be distributed to all areas of the foot. They also help air escape the inner portion of the shoe. The insertion point features the proper overlay in materials. The padding helps for ankle holding and the overlay introduces a small gap for air to be collected or for it to escape. These two functions keep the shoe on the breathable side. Skechers does a good job of introducing comfort techniques that are exclusive to their product lines. Comfort can be accessed through a few different features of this model. The Performance insoles help mold to the feet and keep the bottom of your foot surrounded with foam materials. This foam is not too squishy, which is important for applying the correct foot striking techniques when running. The back-heel features a cut out hole for a simple fit. This keeps your foot both supported and fitting comfortably within the shoe. The outsole is thick and stable, which also works to enhancing that comfortable ride. Durability means are achieved through the multiple instances of reinforcement this shoe holds. The materials often include levels of overlay or overlap. These materials are stitched at these reinforcement locations, keeping the structure of the shoe intact. The back-heel also features a ridge that extends at the heel shank. This keeps this area from caving in or breaking down. Areas that do not feature the stitching are fused with the other elements, creating the proper sealant to keep the shoes shape. The most optimal terrain types are of the flat and smooth varieties. The inclusion of the round grippers allows for you to take on rough terrain with ease. These extensions help to create the proper spacing for adverse surface types, making them a good fit for whichever path you are to travel. The main stability measures are introduced at the outsole, the upper, and the heel cup. The outsole is flat and rests as an even base. There are slight rises that cater to the arch, but it remains flat on the bottom. The upper introduces reinforcement and stitched elements that are on both sides of the shoe. These elements keep the ankle upright and reduce unnecessary movements from occurring at this area. The heel cup keeps the heel aligned and in the proper position. This also helps keep the heel from dipping and prevents the ankle from twisting. Despite the strong makeup, the shoe remains relatively flexible. The toe box area is spread out to cover a larger space, which makes a sound case for flex. The front of the shoe flexes upwards at the correct angles. 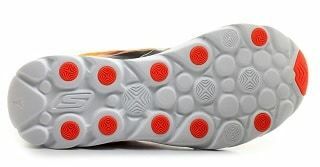 The back of the shoe remains solid, but the Quick Fit notion keeps this area flexible to fitting the many different foot types that users have. The primary use for this shoe is for long-distance running. As a marathon trainer, this model supports the foot in the correct notion, without introducing too many squishy materials. The solid foundation provides the base the user can rely on for continued stability and support, standing up to the longer running paths. Due to strong construction, this makes a fitting partner for the trail running or hiking space as well. 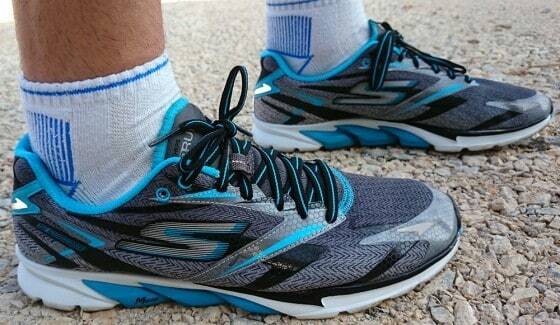 With Skechers moving into prescribed spaces, it is easy to find products that will make for comparisons should the Go Run Ride 4 be unavailable to the user. This is the 4th installment in a product line that now contains 6 different models. The Go Run Ride 5 and the Go Run Ride 6 are the two latest additions to this line. These items feature a little different construction. The outsole is grooved leading up to the undercarriage, a feature that was not included with the Go Run Ride 4. The back-heel portion is also designed differently. With these newer models, the Quick-Fit technology is lifted off the heal cup, extending from the back of the shoe. This helps slip the foot in rather than supported differing heel/ankle sizes. The Go Run Ride 6 works towards the trail-running space, but this feature is only noticed at the outsole of the shoe. If you desire the off-road adventure, the Skechers Men's GOmeb Razor Trainer would be your model of choice. The unique design at the undercarriage is the draw of this shoe. It features a bevy of grooves, extensions and cuts to help grip all of the different surfaces you could come across. The price range of these mentioned models differs slightly, but not too much to make a claim for any comparison excelling over the rest. Skechers continues to extend their knowledge to the different athletic platforms. The Go Run series takes a step back from the approach to ensure the process attains the proper features for support and long-term durability. 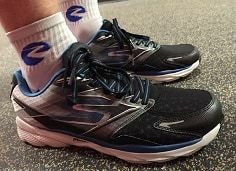 The Go Run Ride 4 model is a lightweight fit that combines the proper usage of all the shoe features. From upper to outsole, the Go Run Ride 4 continues to meet the needs of the user.